Your car, truck, or SUV is a complex mechanism. It has many moving parts that rotate. Some of these parts can wear out or get damaged, at which point they stop rotating smoothly. That can cause the car to vibrate or shake. Let’s take a closer look at what can cause your vehicle to shake, and find out whether you can fix it or if you'll need a certified mechanic to take a look. Your spark plugs need to be in good condition to fire when they should, and to provide the right amount of energy needed to ignite the air-fuel mixture your car runs on. If the spark plugs are dirty or worn out, they won’t do this properly. When this happens, you’ll definitely feel the car shaking at idle. When you shift into gear and drive it, you’ll likely notice a hesitation and a loss of power. Your check engine light may also come on, as the resulting incomplete combustion increases your emissions. Your spark plug wires may also be damaged, worn or improperly connected. Solution: Spark plugs these days last a long time, but they don’t last forever. If you’ve followed the manufacturer’s recommended replacement intervals, they should be OK, but you can still have your mechanic check the condition of the plugs and related wiring. Cleaning the plugs may solve the problem, but replacement parts are inexpensive and may even cost less than the cleaning process. Your engine needs oxygen for proper combustion. If your air filter is clogged, the engine can’t breathe as well as it should, reducing its oxygen supply. This can also affect the amount of fuel getting to the cylinders, because fuel flow is related to the amount of air getting through. Not enough air equals not enough fuel. Your engine shakes because of a shortage of air and fuel in the engine. Solution: Replace your air filter. This is an inexpensive and easy-to-do fix. If you don’t feel up to it, ask your mechanic. A clogged fuel filter will restrict or cut off the fuel on its way into the engine. This condition can also produce engine shaking. Solution: Replace your fuel filter. If you don’t have any experience working with fuel lines, we suggest that you leave this one to your mechanic. If the problem persists, your mechanic may also want to check your fuel pump and fuel injectors. Your vehicle’s engine has several vacuum hoses. If any of these hoses breaks, cracks, wears out or comes loose, the engine can shake, misfire or stall out. This can also cause the check engine light to come on. Solution: Replace any bad hoses and check that all of the hose connections are secure. Your mechanic can easily handle this situation. Your timing belt is responsible for the proper synchronization of your intake and exhaust valves with the movement of your pistons. When everything works correctly, you have a smooth-running engine. But a worn-out timing belt can slip, throwing off this precise calibration. Your engine can start shaking, and in severe cases, with certain types of engine designs, major internal damage can occur. Solution: Get your vehicle to a mechanic immediately. You may even want to have it towed if you have reason to believe this is the cause. 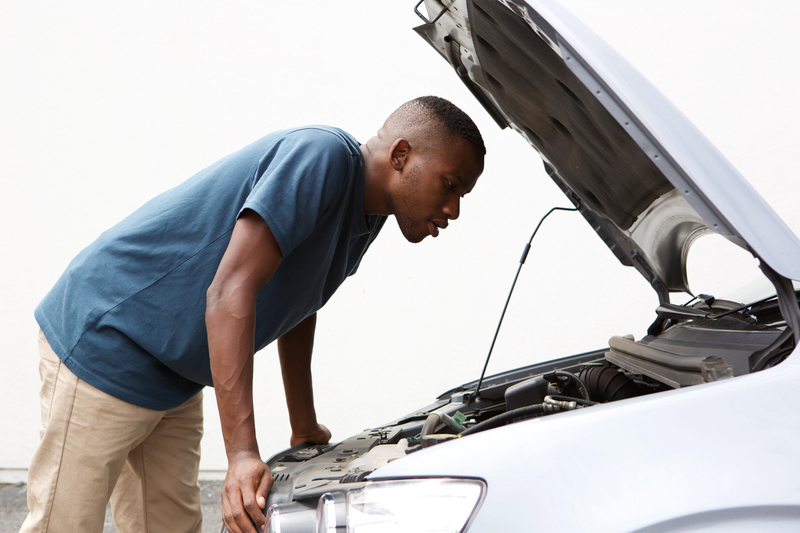 Call your mechanic first and explain the situation, then follow the guidance you receive. Your motor mounts sit between your engine and the body of your vehicle. They absorb engine vibrations, making sure you don’t feel them inside the car, and they keep your engine attached to the vehicle. Damaged, broken or worn-out motor mounts can no longer do these two important jobs well. They will transmit the engine’s movements and vibrations directly into the cabin. You will feel the shaking when idling in gear, but it may lessen in park or neutral. In extreme cases, they may allow the engine to break loose from your vehicle, which could have some very severe consequences. Solution: Get your vehicle to your mechanic right away. This is an issue that needs to be fixed before it becomes very expensive. While these types of engine shaking problems show up at idle, they can also persist when you drive your car. In fact, many of these engine-related shakes will become louder or more intense during acceleration, or while cruising down the street or the highway. Once you shift your vehicle into gear and start driving, more parts start rotating. If your car is shaking while cruising down the road, you’ll want to look at your tires first — though they’re not the only possible culprit. And again, the items mentioned in the section on idling can come into play here. Your tires are the largest rotating items on your vehicle. Every moment your vehicle is in motion, your tires are making contact with the road. This can mean they run into potholes, cracks, rocks, debris and anything else that happens to be there. When your tires are new, they are balanced so that they’ll rotate smoothly without shaking. But once they enter the real world and have to deal with road hazards, they can get knocked out of kilter. This will show up as a shaking sensation that you can feel through the steering wheel, or possibly through the body structure. Out-of-balance tires will usually shake within a specific speed range, most likely while cruising between 50 and 70 mph. Solution: Call your mechanic or visit the nearest tire shop and have the offending tire or tires rebalanced. This is quick and inexpensive, as long as there is no other tire damage. Low tire pressure: Not having enough air in your tires can cause shaking. Low pressure will also cause rapid, uneven tire wear, and may ultimately result in a blowout. Solution: Make sure that your tires are properly inflated before you do anything else. This may solve the problem. Keep a good-quality tire gauge in your glove compartment and check your tires regularly to get the maximum number of miles out of your tires. Unevenly worn tires: If your tires get knocked out of alignment by road hazards, they’ll start to wear unevenly. The tread may wear out on one edge, or you may experience “cupping,” which produces a wavy surface on the tire tread. This can get bad enough over time to result in shaking, and will usually cause increased road noise as you accelerate. Solution: Have your mechanic check your tires for signs of uneven wear. You will probably need an alignment to restore the correct settings, and possibly some new tires if your current ones are too far gone. Tire defects: A defective tire can make itself known in a few different ways. The tire may be out-of-round, or the tread or the internal belts may have separated from the body of the tire. These types of problems usually cause shaking at lower speeds, around 15 to 20 mph. These defects can happen due to manufacturing problems, but they can also be caused by severe road hazards. You may notice a seam, a cut or a bulge on the tread or the sidewall of the affected tire. Solution: Have your mechanic check the problem. Depending on the cause and your tire warranty, you may be covered for manufacturing defects. You will probably need to replace the defective tires. Worn-out or bald tires: Your tires now have little or no tread left. In addition to having very poor traction, stopping ability and cornering power, you will be skidding around uncontrollably if any rain or snow falls. That shaking you feel is also an indication that you are on borrowed time. Solution: Get new tires, without delay. Sometimes the tires aren’t the problem — instead, it’s what the tires are mounted on. Large, deep potholes or low curbs can bend your wheels when you hit them. A big hit can not only destroy a tire, but it can also damage the wheel. Even if you don’t see any obvious damage, these impacts can throw off the balance of the wheel and tire. You will feel the shaking through the steering wheel or the entire vehicle, depending which wheel is affected. Solution: Have your mechanic check your wheels. If there’s no damage, a rebalancing may solve the problem. If your wheel is bent, there are specialist shops that can attempt repairs. If the wheel is beyond fixing, though, you’ll have to replace it. If you have to deal with extreme winter weather, and you notice that your car is shaking during and after snowstorms, it may be suffering from icy buildup in your wheels. Driving in these conditions causes snow, ice and slush to be deposited in and around your wheels. When it freezes solid, it throws off the balance of your wheels and tires, causing that shaking sensation. Solution: If you can’t park your vehicle in a location that’s above freezing, take it to a car wash, where you can spray off the accumulated frozen gunk. That should solve the problem — at least until the next storm hits. Again, the items mentioned in the section on idling can come into play here. But there are a few other possibilities. In addition to your engine, wheels and tires, your vehicle’s drive shafts, U-joints, and axles also rotate at high speeds, and can be sources of shaking. Depending on the layout of your vehicle, some or all of these components are responsible for transmitting power from your engine to your wheels and tires. If this is the case, you’ll feel the shaking under acceleration, and not while cruising at a steady speed or at idle. Solution: Have your mechanic check the condition of these components. The driveshaft may need rebalancing. The U-joints may need to be replaced, or new grease and protective boots may solve the problem. Bent axles will need to be replaced. A pulsation or vibration when braking can affect stopping and handling performance. It’s a serious problem — your brakes are the most important safety feature on your car. You'll want a professional mechanic to inspect your brakes, but expect it to be related to one of these items. If your brake rotors have excessive runout — meaning they have a wobble — or they have variations in thickness, this will prevent the brake pads from being parallel to the rotor face. The pads will slip when the brakes are applied. You’ll feel this as a pulsation in the brake pedal. In many cases the steering wheel will shake, as well. Solution: The rotors should be repaired or replaced. To determine which route to take, the rotors should be inspected and measured. In most cases, a rotor that’s distorted enough to cause a vibration will need to be replaced. Brake drums that are out-of-round can cause a brake pedal pulsation. Other symptoms include a scraping or squealing noise when you press the brake pedal. Solution: The drums should be repaired or replaced. Have your mechanic give them a visual inspection, looking for damage such as cracks, scoring and heat spots. Any of these would indicate that you need new drums. In most cases, a drum that’s causing a vibration will need to be replaced. Wheel bearings allow the wheels to rotate while supporting the vehicle’s weight. The brake rotor is connected to the wheel bearing hub assembly. A worn wheel bearing that has too much play will cause a vibration when braking and will negatively affect the handling and turning of the vehicle. Solution: Replace the worn wheel bearing or bearings. In many cases, the wheel bearing will be an integral part of the hub assembly and won’t be serviceable. The entire hub assembly will have to be replaced. Even if you don’t feel a problem (or hear one), your brakes should be inspected at least once a year. How often you need to get them replaced will vary depending on your car and your brake usage.